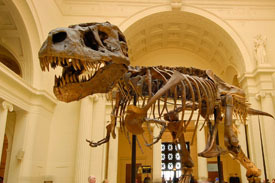 The Field Museum, part of Chicago’s Museum Campus and within walking distance of Adeline’s Sea Moose, educates and entertains with exhibits about nature and culture, prehistoric to present adding to your Chicago private yacht rental adventure. The Field Museum is Chicago’s most elegant and unique setting for special events. Whether it is an intimate dinner for 10 or a rockin’ reception for 10,000, we can accommodate your needs. Let us treasure you and your guests by providing superior service and priceless exhibitions to experience. Year round your groups can enjoy more than 35 world-renowned exhibitions. Don’t miss our Mammals of Asia and Native American Halls; Explore Inside Ancient Egypt, with its mysterious mummies and dazzle your guests with our Hall of Gems. Daytime meeting space, theater space and outdoor terraces are also available.